Elmchee brings together a unique mix of great value, durability & professional crafted accuracy. Now anyone can enjoy pumpkin carving much faster, easier, cleaner.Make expressive life like pumpkin character designs by using the tools to cutout and create realistic 3 dimensional facial details like hair, teeth, nose and eyes. 1 Sturdy zippered premium nylon organizer case. Adult supervision is required when tools are in useNot recommended for children under 9. 【ALL-IN-ONE COMPLETE SET】Includes 13 Professional Pumpkin Carving Tool,6 double-sided stainless steel detail sculpting, cutting and carving tools, 2 sharp heavy duty stainless steel pumpkin scoop tool with scraper,2 sturdy tooth saws,2 hole and circle punches,1 engraving pen.The different specifications of engraving tools are great peeling the rind and for shaping details of the design. 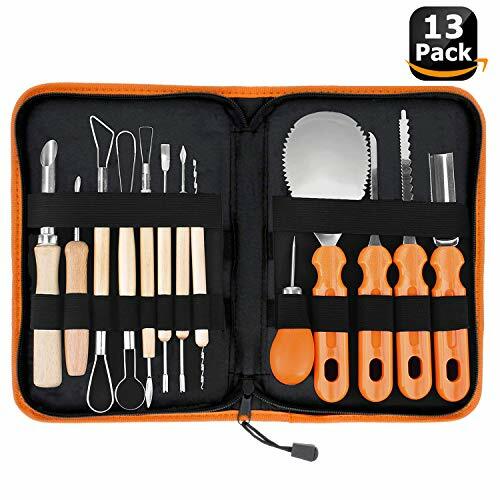 【PROFESSIONAL QUALITY AT ITS BEST】Professional reusable carving tools for use year after year.The ergonomically designed handle provides comfort and confidence in handling.Sturdy & practical. No rust, stains or pitting here! 【LUXURY HANDBAG DESIGN】The tools can be easily stored and acquire protected inside the strong high-end leather bag.When your way to a pumpkin carving contest or to accompany your child to a school pumpkin lantern handmade,It's very convenient to wear it on your wrist. 【A GREAT ACTIVITY FOR THE FAMILY】Creating a jack-o-lantern is a fun job for the whole family. The different parts of the project give everyone something to do.No blade, safer than kitchen knife. 【100% MONEY BACK GUARANTEE】We're dedicated to enhance your carving experience. Our aim: 100% satisfied customers. However, if you're not happy with your Pumpkin Carving Set, you can return it anytime and get a full refund. We'll ask no questions. If you have any questions about this product by Elmchee, contact us by completing and submitting the form below. If you are looking for a specif part number, please include it with your message.